Time is money in business and nothing wastes time more than waiting on suppliers. If you’re wasting time by working with multiple welding suppliers who can’t seem to get you the products you need when you need them, it’s time to give Josef Gas a call. Josef Gas has all the welding supplies you need in one place and we pride ourselves on getting those supplies to our customers in a timely and efficient manner. Josef Gas has roots that go back to 1969, when our founder Joe Stangl started Unitec Industrial Gases. Our family owned and operated company is still run by our Joe who is now joined in the business by his son, Richard. We are not a distributor for another company but are 100% independently owned and operated with our own processing facility and our own fleet of trucks. Joe and Richard have a combined 70 years of experience in welding supplies and industrial gases. This provides us with incredible insight into the needs and challenges of our customers. We are very hands-on. All of our sales reps have welding knowledge and help customers brainstorm solutions all the time. Josef Gas is a fully Authorized Distributor for some of the biggest brands in welding. We have worked hard to make sure we have every need covered so you can work with just one supplier for all your welding supplies! We carry welding wires, tig rod and stick electrodes, industrial gases, and much more. Still not sure if Josef Gas is right for you? Come and see us in person! We welcome visitors to our showroom located at 201 Basaltic Road, Concord Ontario L4K 1G4. You can meet with our staff or even talk to Joe or Richard in person. You’ll soon see why Josef Gas is the right fit for your business! 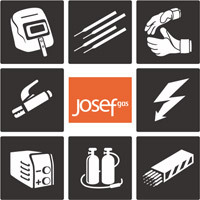 Contact us at 416.658.1212 or info@josefgases.com to learn more about our services and pricing or stop by the showroom to meet us in person.